So far we are having a lovely fall here in Northern Michigan. Lovely warm days and cool evening. We have had a couple of nights with a hard frost but my marigolds are still looking very colorful in the garden boxes. My daughter in Alaska has her first baby appointment this month. We may get a date for the new baby this spring or early summer. Another excuse to go to Alaska and visit. I am hoping for a little girl this time around. Boys are nice, but I would love to have another granddaughter. Beside my daughter needs a daughter just like her. She drove me crazy when she was growing up. My mother always said she was a different kettle of fish and she sure has been. I always thought she should have been born in the 60's and been a flower child. She would have fit in that culture very well. 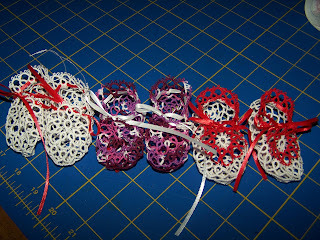 Beside the baby booties I have been making, I have been doing some sewing. I purchased an 18 inch doll last spring and now I am making clothes for dolls of that size. 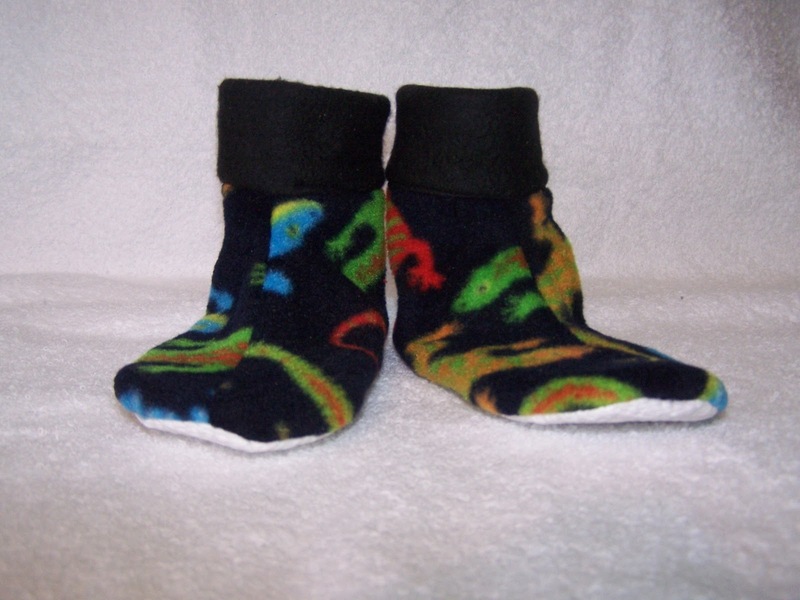 Plus I have made some fleece slipper socks for kids. I need to make some bigger sizes as my grandchildren are older and have big fee. My oldest wears a size 13 shoe! Most of the patterns that I have only go to a size 11 so I have to adjust to make his slippers and socks. I have also been reading my 'nook' . For those that don't know it is an electronic book reader. You can download your books to the reader and read them from there. I found it is much easier to read the new e-ink and the words are so much clearer. I love my reader! So far my sister has gotten one and my best firend. We are all loving them and the ease of reading. So now all of my books are stored in cyberspace and not taking up space in my house. The bootie pattern is by a Mrs. C. B. Platt. It is an antique pattern. I printed it from tatmantat's site. I used Lisbeth size 20 thread. I know the pattern is there as someone just got it last week.